Not to be confused with Point-to-point (telecommunications). This article is about peer-to-peer computer networks. For other uses, see Peer-to-peer (disambiguation). Peers make a portion of their resources, such as processing power, disk storage or network bandwidth, directly available to other network participants, without the need for central coordination by servers or stable hosts. Peers are both suppliers and consumers of resources, in contrast to the traditional client-server model in which the consumption and supply of resources is divided. Emerging collaborative P2P systems are going beyond the era of peers doing similar things while sharing resources, and are looking for diverse peers that can bring in unique resources and capabilities to a virtual community thereby empowering it to engage in greater tasks beyond those that can be accomplished by individual peers, yet that are beneficial to all the peers. 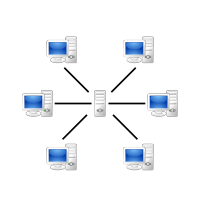 While P2P systems had previously been used in many application domains, the architecture was popularized by the file sharing system Napster, originally released in 1999. The concept has inspired new structures and philosophies in many areas of human interaction. In such social contexts, peer-to-peer as a meme refers to the egalitarian social networking that has emerged throughout society, enabled by Internet technologies in general.